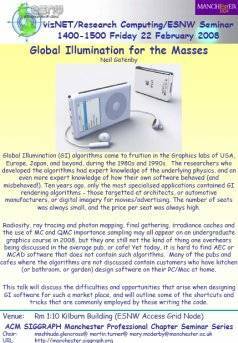 [AG-TECH] AG SIGGRAPH Seminar 22nd Feb.: Neil Gatenby, Lightwork Design "Global Illumination for the Masses"
Previous message: [AG-TECH] AG3.1 and Leopard? Global Illumination (GI) algorithms came to fruition in the Graphics labs of USA, Europe, Japan, and beyond, during the 1980s and 1990s. The researchers who developed the algorithms had expert knowledge of the underlying physics, and an even more expert knowledge of how their own software behaved (and misbehaved!). Ten years ago, only the most specialised applications contained GI rendering algorithms - those targeted at architects, or automotive manufacturers, or digital imagery for movies/advertising. The number of seats was always small, and the price per seat was always high. Radiosity, ray tracing and photon mapping, final gathering, irradiance caches and the use of MC and QMC importance sampling may all appear on an undergraduate graphics course in 2008, but they are still not the kind of thing one overhears being discussed in the average pub, or cafe! Yet today, it is hard to find AEC or MCAD software that does not contain such algorithms. Many of the pubs and cafes where the algorithms are not discussed contain customers who have kitchen (or bathroom, or garden) design software on their PC/Mac at home. They might not use it very often, nor explore its limits when they do use it, but use it they do. There are many millions of such users, and none of them has paid very much for the software in question. This talk will discuss the difficulties and opportunities that arise when designing GI software for such a market place, and will outline some of the shortcuts and tricks that are commonly employed by those writing the code. Preferably use ScreenStreamer software - go to http://www.memetic-vre.net/software/ScreenStreamer/ScreenStreamer.php, and select room "University of Manchester (1.10)" from the AGSC section. Grab the screen feed (by clicking on it) from the screenstreamer window and resize it - more info can be found on http://www.memetic-vre.net/software/ScreenStreamer. Alternatively, the screenshot (not animated) can be accessed at http://192.150.184.66:7890 (this IP might change for some sessions - please check Jabber).